Switcheroo by Aaron Elkins: Synopsis and Online Purchase Options. 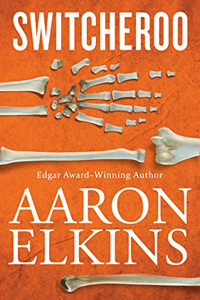 Synopsis (from the publisher): A cold case dating from the 1960s draws forensic anthropologist Gideon Oliver to the Channel Islands decades later to shine a light on the mysterious connection between two men who died there on the same night. Swapped as young boys by their fathers during the Nazi occupation, wealthy Roddy Carlisle and middle-class George Skinner had some readjusting to do after the war ended — but their lives remained linked through work, trouble with the law, and finally, it would seem, through murder. Nobody expects that Gideon's modern-day investigation will turn up fresh bodies. But old bones tell many tales, and the Skeleton Detective has to be at his sharpest to piece together the truth before the body count mounts still higher.